Storm windows are a very economical way to increase your existing window's performance! With their maintenance free exterior and overlap frame construction, a storm will cover most of your existing windows woodwork. Ask your contractor cap your woodwork as he installs the storm window and your window will be totally maintenance free! By adding a storm you add another layer of glass adding more thermal insulation! By adding a storm to a single glazed window, thermal performance will increase by about double! All operating storms come with a sashed screen so if your existing screens are in poor repair, there is no need to fix them, your new storms already come with one of it's own! Storms can be made tall and narrow to fit the window beside an entrance door. 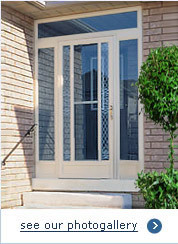 Made with a kick panel to match your new storm door! A handsome couple! Storm windows can be designed to match almost any window design including the picture window above a slider type. For an overlap double hung inside takeoff the width of the insert must be narrow enough to pass through the inside opening. The insert will be 3 3/4" less than the total width ordered. Copyright © York Aluminum 2005. All rights reserved.